Electric motorbikes or cars? What will Vietnamese use? VietNamNet Bridge - Cars are the preference of many Vietnamese, but they remain too expensive in the country, with high taxes and prices among the highest in the world. For VND150 million, consumers can buy a Hyundai Grand i10 in India, but in Vietnam, a Toyota Vios costs the same as a Camry in the US. Despite the preference, small roads, few parking lots and many residential quarters all make it difficult for people to use cars. A report found that the ratio of land for traffic to land for urban areas in Hanoi and HCM City is still below 10 percent, compared to the global average of 25 percent. The situation will not improve in the next 10 years as many multi-storey buildings and shopping malls are under construction. The two-wheel electric vehicle market has been growing very rapidly, according to the Market Management Agency. Of 3 million 2-wheel vehicles in circulation, 70 percent is electric motorbikes. A report said 500,000 electric motorbikes and bicycles were bought in 2017, an increase of 30 percent over 2016. Pollution is getting worse in the country. The AQI (air quality index) in HCM City and Hanoi has been hovering around 100, the level which can affect the respiratory system, especially of children and the elderly. The World Health Organisation said in January – March 2018, Hanoi had up to 82 days with PM2.5 concentration surpassing the WHO’s permitted level, on 91 percent of the period’s total days. Emissions from vehicles is a major cause. The government has been trying to develop public transport and restrict personal vehicles. However, many problems have arisen during implementation. It is still unclear when the two metro stations which have been delayed for a long time will get completed, while Vietnamese still don’t have the habit of using public transport for daily travel. In such a context, some analysts believe that electric motorbikes will be a solution for the future. 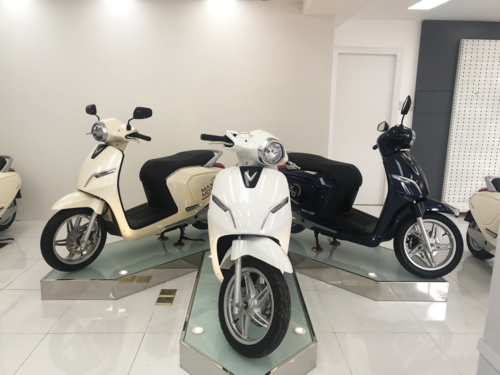 In fact, many people are now considering electronic motorbikes after VinFast, a 100 percent Vietnamese owned manufacturer, introduced the Klara electric motorbike. But to win over consumers, electric motorbikes need to be inexpensive, durable and convenient, not just environmentally friendly. VinFast’s motorbikes and imports are not cheaper than petrol-run products, and there is still a poor network of electric charging stations for electric motorbikes in the country. Will electric vehicles replace motorbikes in Vietnam?